Any way you slice it, B-movie maestro Quentin Tarantino's blaxploitation/spaghetti western hybrid can cozy up to Death Proof as one of his slightest efforts. That's not to say that there isn't plenty of fun to be had, if you're in the mood for a well-shot, ultra-bloody action comedy packed with Tarantino's distinct wordplay — there is. However, Django Unchained feels more like the work of a man getting his ya-yas out than a purposeful look at the horrors of slavery. As Dr. King Shultz (a former dentist turned bounty hunter), Christoph Waltz proves that a great deal of the appeal of his Oscar-winning turn as Hans Landa in Inglourious Basterds came from how he sounds reciting Tarantino's dialogue. Shultz shares Landa's general zeal for conversation and picking at verbal smokescreens. This is a good thing for the film's entertainment value, but further evidence of Tarantino's difficulty creating distinct voices for his characters. This is something he does a far better job of achieving with Django. After being freed by Shultz — to help him identify a trio of criminals carrying a hefty bounty — Django Freeman signs on as a deputy bounty hunter. Initially there's little more than a cheap recurring joke based upon the surprise of townspeople seeing a black man proudly astride a horse and the good doctor's polite and professional handling of violent conflict, but when Shultz agrees to help Django rescue his wife from cotton magnate Calvin Candie (a scenery nibbling Leonardo DiCaprio), a plot is set into motion that's pure Tarantino. 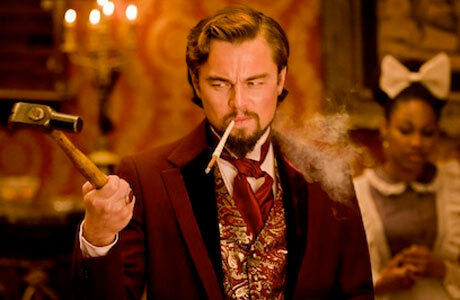 Shultz encourages Django to adopt the character of a black slaver — the lowest form of scum in Django's books — to deflect the potential suspicions of Mr. Candie and his associates while the two infiltrators negotiate the purchase of a fine Nubian specimen to compete in a despicable underground fight circuit as a cover for their real object of desire. Foxx does a tremendous job imbedding his character's seething rage within the confines of a different variety of hate: self. How people hide themselves in roles is amongst Tarantino's chief concerns once again, but aside from the subtle barbed exchanges between Django and head house slave Stephen (Samuel L. Jackson), this theme isn't particularly well fleshed-out. The sheer demands of gleeful violent revenge win out at the end of the day, with the picture devolving into the same "burn it all down" mentality displayed in Inglourious Basterds, but without that film's mechanism of being part of a scenario that had a greater influence on the larger problem of persecution.